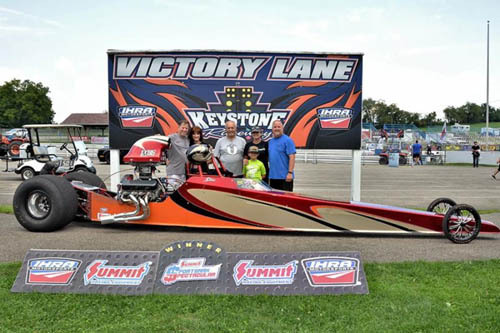 NEW ALEXANDRIA, Pa. - Thanks to the support of the International Hot Rod Association's great partners, several drivers came away with round prizes at the IHRA Summit Sportsman Spectacular event at Keystone Raceway Park. Those with the best losing packages in the first three rounds on both Saturday and Sunday all earned prizes. In the first round of Saturday eliminations, Box racer John Varner received a Summit Racing Equipment 10 x 20 tent. No Box racer Rick Heinrich received a Sunoco $100 fuel certificate, while Junior Dragster racer Grace Rowe was the recipient of a Summit Racing Equipment 10 x 10 tent. Dean Gomish came away with the American Race Cars $250 gift certificate for the Box division. Barry Barnett had the best No Box package, getting a $400 certificate from Abruzzi Transmissions toward an 8 or 9-inch converter. Ryan Leasure received a new Summit Junior car cover for his Junior Dragster. Round three, the "Moser Money Round," featured Box racer Josh Rietscha winning a $300 Moser certificate and a $250 Jones Transmission Cooling Systems certificate. Kerry Balaska received a $300 Moser certificate for No Box and Maicy Stewart got a $150 Moser certificate for the Junior Dragsters. Sunday first-round prize winners included Box racer Dean Gomish going home with a Summit 5 jacket and No Box racer Mark Romeo receiving a Summit single-layer jacket. Myah Gross picked up a Junior Dragster re-entry certificate. Dan Quinlan was the recipient of the American Race Cars $250 gift certificate for Box racers, while AJ Casper won a Sunoco $100 fuel certificate for the No Box prize. Junior Dragster driver Jaden Maze went home with a Summit Racing Equipment single layer jacket. In Sunday's third round, Michael Shupp in Box got an Abruzzi Transmissions certificate for 10 percent off the purchase of a new transmission and a Jones Transmission Cooling Systems $200 certificate. Craig Miller's loss in No Box was made a little sweeter with a Summit Racing Equipment 10 x 20 tent. Joey Stojakovich received a new Summit Racing Equipment Junior Dragster cockpit cover. Racers have a chance to compete for big money, take home their own round prizes and get contingency bonuses at future IHRA Summit Sportsman Spectacular events by clicking here.